Bill Maher is a funny guy. 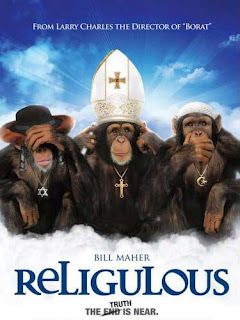 But one must also factor that, in Religulous, he's got a really easy target. Traveling the world to speak with religious figures, Maher offers a convincing case that all religions, when viewed fundamentally, are the same: knuckle-headed. From Catholics to Jews to Muslims to the more wacky Mormons, Scientologists, Evangelicals, and Congressmen, there's no end to the deluded blank stares of people Maher interviews who are unable to argue or even understand their own beliefs in the fairy tale known as the Bible. There's a great list of the interviewees here. And many are worth looking into a little more either for a laugh or because they're so incuriously nuts. Probably the best interview is with the "Pope's principal Latinist," Father Reginald Foster. He's quirky and actually intelligent. Not sure how the Pope hasn't fired him yet. Give credit to Maher, who knows he has an audience. While he might irritate people when talking about their religions, the American Religious Identification Survey found those claiming "no religion" has grown from 8.2 percent of the U.S. population in 1990 to 15 percent now. And Maher also ends the movie with a strong commentary, urging atheists to stand up and speak out before the religious freaks finally drag us down for good.